" Thich Nhat Hanh teaches us that compassion is a verb. Compassion without action is not very meaningful. We practice love in action. What Dr. King was practicing was also love in action as a spiritual path to liberation." "The highest tribute we could offer Dr. King (and Thay) is not to praise him, but to be his continuation -to embody the practice of peace and non-violence. To be the beloved community. As he proved....It is love that will bring about miracles in the hearts of men." -excerpt from a talk I gave many years ago.. I hope you are all well an enjoying the calm before the storm. Speaking of which, it sounds like we will have mostly rain down here...but the temperature is supposed to drop all afternoon and create a quick freeze of anything that has fallen. So since that is predicted to take place right around the time we would be meeting, we are not going to ask you to risk the trip. Richard and I are going to be sitting here and hope that you will also take some time to sit at your cozy, warm home also. I am sad in that this is the weekend when we honor Dr. Martin Luther King, Jr. 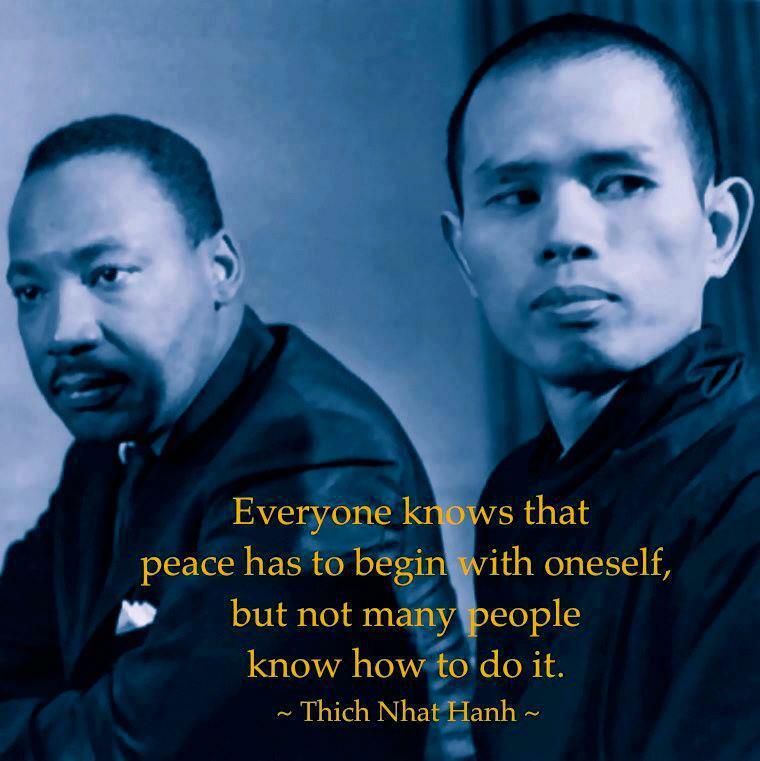 He was a good friend of Thich Nhat Hanh. This is one of my favorite holidays. So in lieu of a Dharma talk, I have included a transcript of a talk I gave many years ago...I share it annually. Every year I get inspired all over again. In the spirit of Dr. King, some of the members of the RI Community of Mindfulness will be gathering on the Smith Street side of the State House today at 1:45 to stand up to the injustices that are being created in our country. As I have shared, I, personally am horrified at our treatment of families and children at our border. According to our Ninth Training - "We will do our best to speak out about situations of injustice, even when doing so may cause difficulties for us or threaten our safety. "I hope you will be able to join us and we can be joyfully together taking a stand out of love for our fellow beings, not out of hatred for anyone. Dr. King and Thay have been such a glorious embodiments of the power of one person to inspire others and have them join him in his aspiration to transform and heal our unskillful states of mind so we can live in the awareness of interbeing and be peace. I am feeling enormous gratitude for all they have given us. I am also feeling enormous gratitude for the gift of Mary Oliver's life. She died on Thursday. Her poetry has given so many of us so much joy and solace. Her poems are bells of mindfulness to invite us to pay close attention to everything, recognize our interbeing and be in awe of this miraculous cosmos, of which we are a part. Here is a link to a wonderful interview that she did with Krista Tippit for On Being. You can hear her read "Wild Geese" Enjoy!! Just a reminder that Next Sunday we will be gathering at St. Augustine's Episcopal Church in Kingston on Lower College Rd. at 6 PM. I hope that our paths connect soon and that you all weather the storm in fine fashion. You may wonder what a Buddhist is doing here honoring Dr. Martin Luther King, Jr. I have been a student of the Vietnamese Buddhist monk named Thich Nhat Hanh for 16 years.. He was a close friend of Dr. King and in 1967 he was nominated by him for the Nobel Peace Prize. The practice of Engaged Buddhism is very similar to Dr. King’s practice of non-violence. Thich Nhat Hanh teaches us that compassion is a verb. Compassion without action is not very meaningful. We practice love in action. What Dr. King was practicing was also love in action as a spiritual path to liberation. I was a teenager when the civil rights movement was happening. I was so amazed at the power of this one teacher. That he could inspire and motivate people who were being beaten and abused to respond with love and nonviolence and thus change the course of history. it was truly astonishing. What was it that he did? How did he do that? The promised land was his vision of a world in which all beings are equal and treat each other with love and respect. He had been to the mountain top. He had seen the promised land and what he saw was the truth – that “we are caught in an inescapable network of mutuality – tied in a single garment of destiny. Whatever affects one directly affects all indirectly. “ In our practice we refer to this as interbeing. In 1956 at the First Annual Institute on Non-Violence and social change, he stated that “love might well be the salvation of our civilization...the end is reconciliation, the end is redemption; the end is the creation of the beloved community. ...It is love that will bring about miracles in the hearts of men.” And he was right. It did. He embodied the practice of nonviolence. He practiced what he preached – Love, non-violence and fearlessness. He was a man whose house had been bombed, the two people he loved most were in danger and right in the midst of it he could maintain his equanimity and practice nonviolence. He looked deeply enough to see that Jesus wasn’t just talking to hear himself talk when he said “Love your neighbor as yourself. ..Love your enemy”. He knew it was the only thing that would work. It’s not unrealistic, naïve idealism. It is absolute pragmatism. He looked beyond the horrible events of the present – the hatred and violence to see that moving toward the promised land of respect and equality is the only way we will survive. We have been conditioned to believe that revenge is the only answer. If someone hurts you, hurt him more. I would ask...”How’s it working for us?” Look at the Middle East and the answer is obvious. We may win a battle, but if in doing so we have planted thousands of seeds of hatred and fear..the war is not over- only the present conflict has ceased. There will be no peace as long as we react to violence with violence. That is true in our personal lives as well as in our national and international politics. If I am harboring hatred, anger and resentment, I am not at peace. Peace is not simply an absence of war or conflict. Peace is a deep personal practice of transformation. If I am not at peace, I cannot create peace on this planet. Many look at responding to violence with love as being weak- as being a doormat. King said “Don’t ever let anyone pull you so low as to hate them.” Love is the ultimate position of strength. In talking about the power of love, He said, “We shall match your ability to inflict suffering with our capacity to endure suffering. We will meet your physical force with soul force... You throw us in jail, ...bomb our homes,... beat us and we’ll still love you. ...We will wear you down by our capacity to suffer, and one day we will win our freedom. We will not only win freedom for ourselves; we will so appeal to your heart and conscience that we will win you in the process, and our victory will be double victory.” And that’s exactly what happened. Dr. King did not put himself in the path of a bullet so that we would come together once a year and parrot his glorious words and think,’what a shame,’ what a tragedy that he is gone. NO. He put himself in the path of that bullet because he was the embodiment of what he preached – Love, justice, fearlessness, peace. He had a calling. He did not let his small self, his own fears, his own doubts, his own desires to see his children grow up, supersede his larger truth. He had been to the mountain top. He had seen the promised land and he knew that he would never die . His body may be gone, but he is alive and well in every cell of every being that was touched by him. His death was a mandate for all of us who were touched by him to change the way we live and the choices we make, to transform the hatred, anger and violence in our own hearts. To practice what he preached. To embody his teachings. To be peace. To be love. We all suffer. In the peace movement there is a slogan. If you want peace, work for justice. As long as our prosperity comes at the price of suffering, starvation and deprivation for others, there will not be peace on earth. As long as we refuse to acknowledge that other people’s suffering is our business, and do what we can to alleviate it, there will not be peace on earth. The highest tribute we could offer Dr. King is not to praise him, but to be his continuation -to embody the practice of peace and non-violence. To be the beloved community. As he proved....It is love that will bring about miracles in the hearts of men. May we do our best to take good care of ourselves and each other so that we can create the conditions to manifest peace on earth.